I didn’t get to see this one at the cinema but I saw it his summer on dvd. The trailor was amazing and it had Benedict Cumberbatch in it so I thought I’d really like it. Maybe I built it up too much because I was excited by the trailor and actors as it didn’t quite live up to expectations. Maybe I also should have checked out what it was based on. The books and original tv series were very slow moving with a heck of a lot of detail on a lot of important things. There’s a lot of depth and this film was the same. It moved much slower than a similar genre film normally does but every scene, pause, breath and still frame was important to the plot. Visually the film was very old feeling and made me think of the original Italian job which I actually quite liked. It felt cold war ish like the russians might turn round and a bomb our country at any moment if things went wrong. Not really very james bondish though, just important. It was a very men’s men film. Everyone was well dressed and most sounded rather posh, especially Benedict and Colin Firth. Unfortunately the plot was a little see through. I’d worked out who the bad guy was fairly early on and just watched the rest, although it was more the way the character acted than actual evidence. He just seemed to be the right fit. I’m going to watch it again because I think I’ll notice more of the details the second time around and get more from it but I don’t think I’ll watch it too many times more than that. Sherdan picked up the phone and tapped in Mark Jones’ number. He went through the same hassle of having to get approval from the first voice on the phone before he could get through to the Prime Minister himself. “That won’t be necessary Dr Harper. This country does not negotiate with terrorists and that is exactly what you’ve become.” The Prime Minister hung up on him. “Have our prisoners spread out between our safe houses, and fetch those tanks.” Sherdan ordered. The tanks would be moved to face outwards at the same exits they were currently stuck in. The soldiers watched helplessly as three guards walked out towards each tank. The two on each edge walked forwards, emitters in the ruck-sacks on their backs. The middle man got into the tank and drove it into Utopia, turned it around and aimed it at the very troops who had been using it only hours before. This was repeated at every main exit. As each vehicle was put into position a small cheer went up in the command room and the atmosphere relaxed. People smiled and sat back down after all the standing and rushing around. Less than three hours after the first soldier had tried to enter Utopia the battle was over and the victor was clear. The British army was four tanks and sixty guns down, and Sherdan had gained it all with no injuries and no extra cost. When it looked like the attack was over Sherdan had the residents informed and went back to Anya. She had stayed, her legs tucked up under her, reading the entire time. She looked pleased to see him though. “How bad was the first attack?” The look of concern on Anya’s face shocked him. She cared more than he expected. “Well, I hope that’s the last. Putting peoples lives in danger, no matter how low the risk, is wrong.” Sherdan didn’t bother responding. He felt worn out by the day and didn’t want an argument. The afternoon had managed to push all thoughts of his tests with Hitchin out of his mind. He had arrived back at the house with Anya before he remembered that he needed to go back to the lab. He sent Hitchin an email to let him know they’d try again the following day. He’d explain why when they met. Anya didn’t say much their entire evening together. Sherdan sat with her but soon found himself drifting towards work. The UN had replied to his application for recognition as a country and were requesting even more information. They also had recommendations to speed the decision and help it in his favour. Most of the suggestions were obvious things like contact officials in nearby countries and display openness to discussion and diplomatic relations. Laws also needed to be in place and all sorts of people in diplomatic positions needed filling. They thought his population was a little low but Sherdan had plans to increase that. Many of the previous applicants had contacted them in some way requesting to be considered for citizenship as well as the training program. Everyone that had was moved to the top of the waiting list. Several news reporters had also requested to enter the country and do pieces on his progress. Sherdan would use these opportunities wisely and scheduled in a satellite link up with a news studio for noon the following day. The rest had all received written statements in reply to their requests. He definitely did not have time to be interviewed by all of them but hoped they would think him cooperative at the least. He also wanted the British people to hear what their government were doing in the people’s name. He didn’t think many of them would be happy with the attack and he intended to stir as much of them up about it as he could. His two MPs in each of the three major political party had fed him the reaction to today’s discussion in the house of lords. There had been an outrage that troops had been moved in so soon, especially as videos of the police raid had been leaked and all the MPs had seen it. Sherdan watched the late news, knowing most of the focus would be the raids on Utopia. The reporter went through all of the other news about the rest of the world in the first ten minutes of the show. The police raid was the first focus on Utopia. The leaked footage was aired. Sherdan laughed when he realised it was all the camera feeds he’d sent to Mark Jones. Someone must have got a hold of it after that. Anya joined him to watch, noticing what the video’s were of. She exclaimed out loud when the police fired on a guard and all the bullets fell to the ground. He delighted in the look on her face. He intended to explain but the news reporter reappeared and continued his piece on Sherdan, informing anyone who didn’t know, about the recent claim for independence. They followed everything up with footage from outside the barriers that day showing all the soldier’s failed attempts to get in and, finally, a clip with the tanks being taken and turned on their own army. “If the government had seen the leaked footage of the earlier police raid, which is now all over the internet, it comes as a surprise that they tried such measures with the army.” There was a brief pause as the reporter waited for this to sink in with the audience. Sherdan beamed. The news reporter had not only referred to the area as a country but obviously didn’t approve of the guns blazing approach Mark Jones had taken. He had been brave enough to say so on air which would enforce the public’s ability to say what they really thought. Anya still looked shocked. She’d not known about any of the technology Sherdan had to defend the country and people with. She nodded absent-mindedly. It was clear she hadn’t fully absorbed everything she’d learned. “I wish to create Utopia here on earth. A new Eden. You can be my Queen. You only have to say yes,” he offered, realising how much he wanted it as well. She looked at him, her eyes sad. He took her hand. Anya kissed him on the cheek again and said goodnight. She had not mentioned her God but he knew she’d been thinking of Him. He hadn’t got cross with her this time, however. It made him feel sad more than anything else. He wanted her of all people to understand him. Sherdan went back to his work. He didn’t want to sleep yet and a very interesting email had come through. Someone unknown was offering him a very large sum of money for the shield devices each guard wore. He spent the next hour trying to figure out where the email had come from, not that he had any intention of ever sharing the technology. It seemed to be Russia but he wouldn’t be surprised if they were only trying to make it appear from there. Sherdan replied, politely saying no. His technology was the biggest advantage they had. He needed that advantage. At three in the morning, Sherdan went to bed. He checked on Anya on the way. She slept soundly, looking every bit an angel in the moonlight from the window. It took a long time to tear himself away from her to his own room. 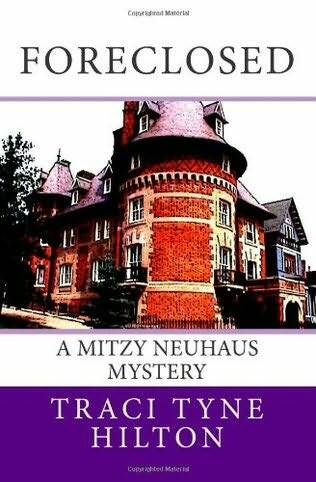 This is a Christian mystery book about a woman called Mitzy who runs her own estate agents and gets involved in some crazy stuff when a house she wants to sell gets tangled up in Russian history. I’ve had this book on my tbr for ages and finally got around to it. I’m so glad I did. The book was cute, quirky and I really liked Mitzy even though she did seem a little too sure of herself. She was well portrayed and althought very feminine I decided I liked her. She had guts and was a self made woman and that really earnt my respect. I like Christian women who aren’t afraid to be a bit different. The plot flowed nicely and although I could see all the twists coming it didn’t detract from the entertainment of the book as it all felt real and believable. Considering the plot after reading I’m mildly surprised it felt so real because it’s quite a mash up of things I wouldn’t expect in one book but it was well done. I especially loved the puppy but I won’t say more about that. If you like fun girly reads this is the perfect book and for anyone else wanting to pick up some easy going Christian fiction that’s more about telling a fun story than trying to push some massive Christian message. I’ve just picked up the sequel and added it to my TBR. I know this could be considered a little late but I thought I’d give my opinion on the Olympics this year, considering that my country were the hosts too. 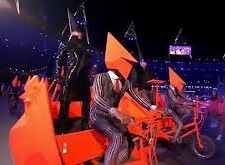 First off there was that opening ceremony. This was the part most of our country was worried about. We could have done an awful job but actually it was amazing. I don’t expect that everyone in other countries would have really understood it but it was very British and well planned out. 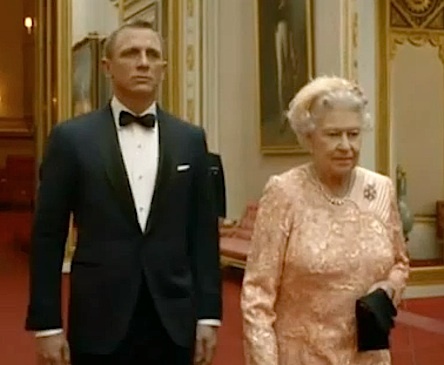 My favourite bit was when James Bond went to pick up the Queen in the cut away video. We all thought it was just a Queen lookalike but when she turned around and greeted him and revealed that it was indeed our monarch a cheer went up in our house full of spectators. I had heard she had a good sense of humour but I think this just proves it. She even allowed her darling Corgis to be in the video. into the industrial age, tower-filled forge below. And yes that is the same house in the shot and that ring to the left is covered in grass in the first shot. Amazingly they managed to do this while stuff was going on around. 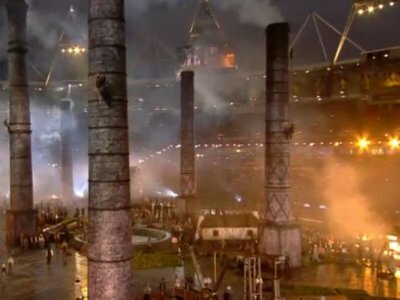 Workers appeared and stripped back grass while others appeared to be winching up the towers into the middle of the stadium and Isanbard Kingdom Brunel surveyed it all with satisfaction after reading out an excerpt from the Tempest. On top of that we had sillyness from Mr Bean and one very amazing music medley of 60’s to the present. 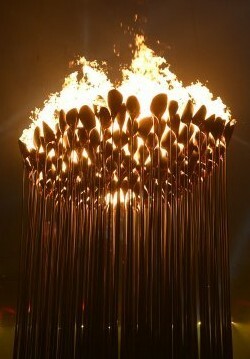 The final stunning part, however, was the Olympic flame itself. 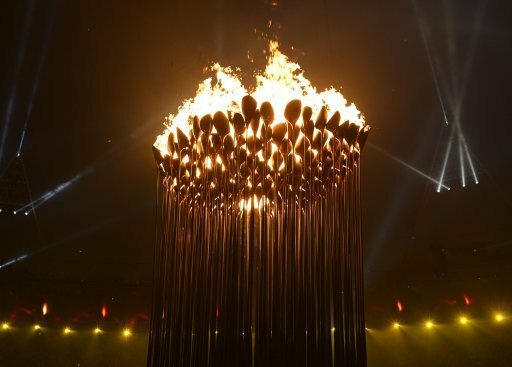 Not only had they managed to keep it secret that seven young athletes were going to light the Olympic cauldron instead of an established professional as it normally is but they had also managed to keep it quiet that the copper petals each country carried in with their parade actually all came together to make a stunning cauldron. Each petal alone was stunning as you can see to the right. and there were 204 of these that came into the arena, one with each country. All we knew as they were coming in was that they were very pretty and we were told they would all feature later. Well they all ended up in the centre in a spread out spiral. As the bottom few were lit the flames jumped from petal to petal around and up the spiral and then it was all lifted up to create one large cauldron. Not too bad really for an opening ceremony from us. I also really liked that almost everyone involved was a volunteer. It was nice that any old joe could give up time to practice and get to take part, as well as all the builders being honoured during the torch bearing. Unfortunately the first day of the olympics didn’t go quite so well in Britain’s favour. We had hopes in the men’s road race but just couldn’t get enough other teams to work with us to catch some early leaders so none of the British could get near a medal. The following day saw us pick up a couple of medals, however. We did a lot better in the women’s road race and picked up a silver, then a bronze in the pool with Rebecca Adlington. Monday saw us do well in the Equestrian cross country after our good start in the dressage. We also did well in the gymnastics, though there were upsets there with the Japanese fall that was possibly a wonky dismount. Tuesday granted us a silver in the team equestrian which wasn’t too surprising after the amazing cross country we had the day before. Then all of a sudden it really took off on the Wednesday with the female rowers getting us our first gold medal and then over the following days we got loads more in the cycling, rowing and even a few unexpected ones in the athletics. The second Saturday was our best day with six gold medals being acquired throughout the day. I believe they were two rowing ones, a cycling one and the female heptathalon, men’s long jump and men’s 10,000 run. On top of a bunch of silvers and bronzes. By the end Team GB had 29 golds 17 silver and 19 bronze medals, a lot more than had been expected and I think our best games for over 100 years. The whole buzz and excitement of the olympics was extraordinary too. Almost everyone was talking about it and watching as much as possible. Eventually the games reached the end and we came to the closing ceremony. 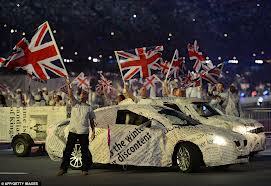 This was put together by someone different but still followed a similar theme to the opening ceremony. There was a lot of music and bands playing. Unfortunately not everyone could sing as well as they used to but they did their best. It started with Winston Churchill reading more of the Tempest from inside the top of Big Ben while chaos ensued around him. There were suddenly street parties and golden oldie songs beginning with Our House by Madness, who popped out the back of a newspapered covered truck driving around the edge. 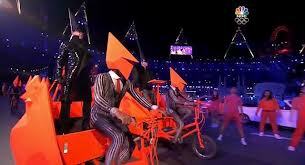 As they sang more newspaper covered cars, people and dancers appeared around the stadium and the stadium led a rendition of parklife, which led into westend girls by the pet shop boys being driven around on bright orange chariots. I kid you not. Bright orange chariots! I did spend most of my time wondering how their drivers could see and also wondering if the petshop boys had done something naughty to deserve their black dunce caps. It was entertaining at least, however and did make me think of their whacky music videos. Unfortunately then came the first of the oldies who is getting a little past it now in terms of singing voice as Ray Davies tried to treat us to a rendition of Waterloo Sunset. It could have been better but it was bearable and watching everything else going on around him was at least interesting. 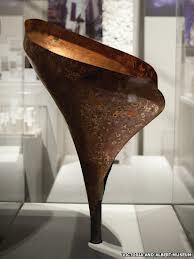 This was rescued by Emeli Sande who sang read all about it on her newspaper covered car. Thankfully at this point all the newspaper disappeared and the parade of atheletes final medal ceremony and all of the official things happened. The best bit of this was allowing the atheletes to enter from all parts of the stadium so all the crowd got to see them and congratulate them as they walked in. I thought that was a great idea. After everything official they started us off again with an excerpt from Bohemian Rhapsody, which led into Imagine by John Lennon, sung by The Liverpool Philharmonic youth choir, followed by more madness from George Michael’s white light and the Kaiser chiefs version of Pinball Wizard. Then things got more odd with David Bowie’s fashion and those lorries that were newspaper covered earlier all came back with lots of big fashion brands and models on their sides. At the end of the song they all opened up to reveal models for each brand and some very lovely dresses, plus one man. And at that point, just when you didn’t think things could get any more odd Annie Lennox came on stage to sing Little bird. Her mode of transport was a sail-less boat, complete with a guy holding wings up for her. Thankfully she sang better than she did in the Queen’s jubilee celebration and I really liked her boat. Everything else was a bit odd but the boat was cool. The next song was pure genious with Ed Sheeran singing Wish you were here with a band comprising of a genesis member, a pink floyd member and several others. Russel Brand then added his mix of eccentricness into it by singing pure imagination from the original charlie and the chocolate factory film followed by I am the walrus. Which led into Fatboy Slim dj’ing from a giant octopus for a couple of songs and then a medly from Jessie J, Tinie Tempah and Taoi Cruz, who sang their own songs followed by coming together to sing the Beegee’s, you should be dancing. 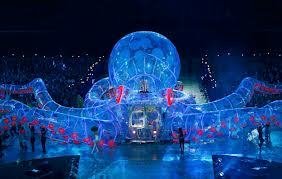 Unfortunately this very bright vw camper powered octopus was followed by another oops of the closing ceremony. Five taxis came driving into the stadium with some passangers most people probably didn’t want to see, the Spice Girls. They climbed onto the roof of their taxis and drove around singing a medley, although thankfully some of it was mimed. 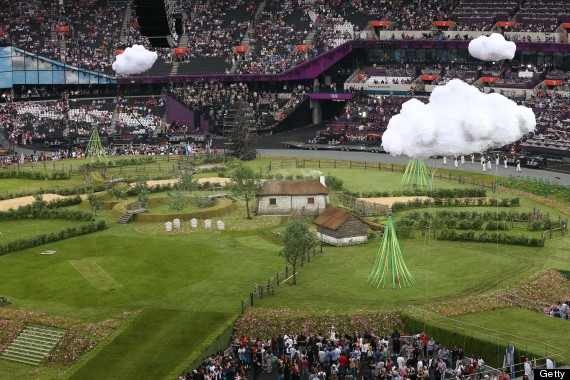 When that was finally over the director decided to take a leaf out of the opening ceremonies book and went back to the eccentric humour the brits are best at. 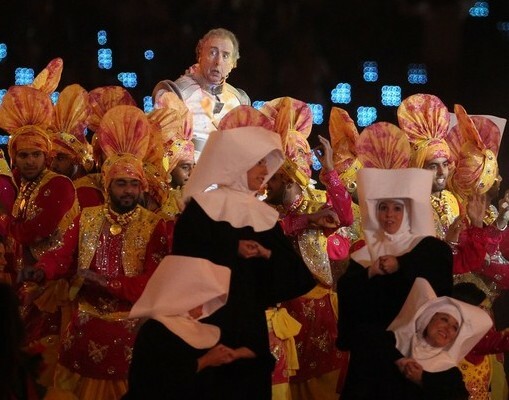 Cue Eric Idle and, Always look on the bright side of life, complete with new olympic lyrics and some great dancers. Yup, that’s us Brits right there. 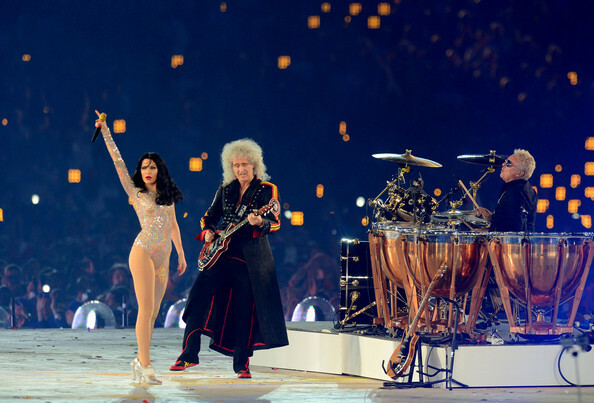 After this it pretty much wound up to the extinguishing of the olympic torch with the official olympic song by muse, a brilliant screen of Freddie leading everyone in random scatting from a recorded concert moment and a phenominal guitar solo from the ever loved Brian May. 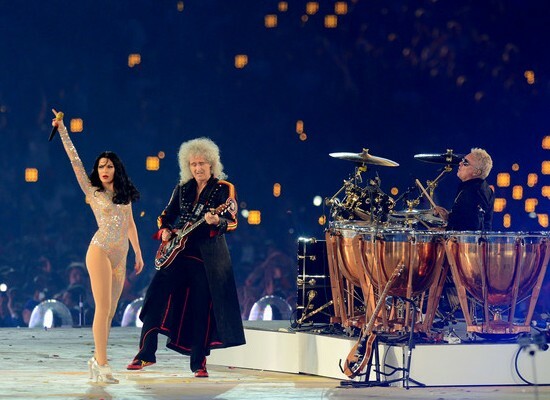 He was then joined by Queen’s drummer and Jessie J helped provide the vocals to We will rock you. 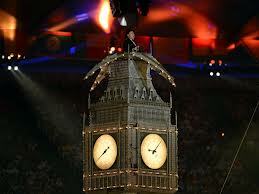 Once the flame was extinguished there was Take that and finally a trio of songs from The who. All in all not too bad if you forget the few that seemed more pointless. 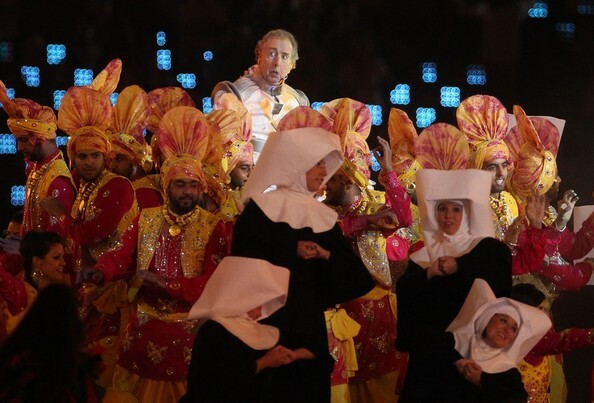 I Am torn between Eric Idle and Queen +Jessie J for best act of the night, however. This concludes my olympic round up. Right now I’m very proud to be British. 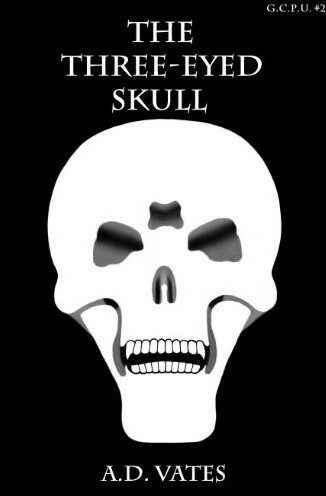 I’d never actually seen a black and white film before I saw this one and I have to say I was really rather impressed. As someone who appreciated dialogue the most in films I was a little nervous I’d find the almost two hours of this film absolutely dull and boring. Thankfully I didn’t. The atmosphere of 11 people together in one room probably helped, especially as we added a comment or two and occasionally put words into the mouths of the actors but it still entertained me and I think it would have done had I been alone as well. Plot wise it wasn’t anything fantastic but for a silent film it worked well. It enabled the director to play around with the concept of a silent film and make it work in ways it wouldn’t have done when films were originally silent. It also showed some elements of the film world that actually parallel what it’s like today. The actors were brilliant and I think did a good job of having to over exaggerate their every movement to make it come across well on the screen. That’s not something that’s easy to do and appear natural. There was a cute and quirky sense of humour to the film as well which had me chuckling at several points. I’m sure this was also helped by the lead actors smile. He had one of those cheeky smiles which could win you over in an instant no matter what he was doing. On top of that was the dog, one of the best acting dogs I think I’ve ever seen, completely perfect. Definitely glad I watched it as it was a brilliant piece of storytelling without the use of dialogue, something that’s really not easy to do. Sherdan set his alarm an hour earlier the following morning and asked for an update on the emergency cabinet meeting less than five minutes after opening his eyes. They’d adjourned the meeting very late in the night to continue the following morning. He ate breakfast while getting ready to leave and woke Anya to tell her he was going. “Already?” she asked through blurry eyes. “Yes. Keep a radio with you at all times. I don’t know what might happen today.” She nodded and laid her head back down on her pillow. He went straight to the command centre. The night team were still there and they looked tired but relaxed. There wasn’t anything new to report. Mark Jones was still inside the cabinet meeting and they hadn’t stirred for a few hours. “Have our request for recognition sent to the relevant official at the UN,” Sherdan ordered as the first call of duty. If he could get the UN involved quickly it would increase his chances of getting England to accept what he’d done. As soon as the first task was completed he phoned the government in Ireland. “One moment please,” the woman informed him. He had to wait almost half an hour before the Irish prime minister took his call. Sherdan thanked the man and said goodbye. He spent the rest of the morning contacting as many governments in as many different European countries as he could. Very few of the secretaries would actually let him through to their leaders. One or two didn’t even know who he was. He tried to explain and get them to believe he wasn’t a prank caller. By the time Sherdan stopped for lunch he felt exhausted so he went to his private room to take a break for a few minutes. It jogged his memory about Hitchin asking for him the night before. He’d put it off for as long as he could and would have to tell Hitchin his ability had gone. With a sigh, he trooped through the building on his way to the lab. Everyone stayed out of his way. He had a permanent frown fixed to his face. Hitchin noticed it too and put down the folder he carried as soon as he saw Sherdan. Neither of them spoke for some time. Hitchin knew to wait when Sherdan looked like this, and Sherdan still didn’t have the words to say what he wanted. “I think my abilities are gone. It’s not worked since Anya arrived… At least, I don’t think it’s worked since then,” he finally got out. Hitchin frowned. Before they reached the room, Sherdan’s radio called for his attention. “Okay, keep him on the phone. I’ll be right there.” Sherdan left Hitchin without even saying goodbye. He went back to the command centre as fast as he could. “We don’t think you’ll endanger the people there with you and, if you do, you will prove that you don’t have their best interests at heart.” Sherdan couldn’t help but laugh when he heard this. “You really believe you’ve got me backed into a corner? Well good luck to you. I will not be opening up my barriers.” Sherdan hung up. Graham already had his radio in his hand, informing the guards of the expected attack. Once he was done he also told the residents while Sherdan contacted Anya. She seemed reluctant to leave his house even when he stressed the danger she was in. As he talked to her on her way over he watched the screens. The army were no longer sitting around with nothing to do. Ranks were forming and vehicles were being started up. Graham scanned the radar for signs of the military in the air. RAF Lyneham wasn’t far away and was the number one site for establishing temporary bases. They also had a lot of planes at Lyneham and Brise Norton. He soon saw the blips on the radar that indicated planes on a flyover trajectory probably with the intention of dropping troops. He informed Sherdan straight away. Everyone in the security team was alerted and prepared. They’d increased the number of security guards over the last few days. There were over a hundred in total now and all had been put through very thorough training. As they were being deployed Anya arrived at the command facility. She’d brought a book with her and curled up on the bed. Sherdan promised to check in on her regularly but she didn’t appear to want to talk. He soon left her to go back to watching the TV screens. Each guard carried the same shield device as they’d used when the police had shown up. There was also a shield attached to each residential shelter, the command room, and one large one that encompassed the whole country and shielded the country from outside forces. No bullets or weaponry could penetrate from outside, only the weaponry each soldier brought in with them could cause any damage. Not even grenades could harm people. Sherdan watched on the cameras as the soldiers tried to advance through the barriers. The guards didn’t even acknowledge them as they walked into the barrier, went dizzy and retreated. A few tried to push on, having been trained to keep going and obey orders. They soon lost control of their bodies and had to be pulled out by their comrades. Shortly after, the first few troops parachuted into the country. The guards watched them approach long before they landed, and snuck in groups to surround the expected landing points. The soldiers rose to their feet to find many guns aimed at them already. Each soldier was moved to one of the various safe houses to be imprisoned and the guards went straight back to work on finding more. Less than a third of all paratroopers made it past this initial net. Still, none of the troops had got in from the streets. Sherdan sat in the command room with a very large grin on his face. Graham issued instructions behind him as he watched and waited. His pulse felt a little elevated but his worry was not apparent to anyone else. The guards were fed information from the command room to help them go after the remaining soldiers still loose. Four of them had managed to group together and there were another twelve scattered in different areas in ones or twos. All of them moved in the direction of Sherdan’s house. It almost made him laugh out loud. Despite their tactics being flawed, they were wiser than the police officers from two days earlier. Sherdan noticed they moved faster and more confidently than the police had. They also regularly checked behind themselves, making it difficult for the guards to sneak up on them. Ten minutes later only two of the sixteen soldiers had been stopped in their tracks and escorted out of the way. The four moving down the high street were the ones of most concern, especially when they were joined by another two soldiers the guards hadn’t circled in time. If the group got too big there would be the risk of gunfire and related problems. The smile on Sherdan’s face disappeared and he sat up a little more, his eyes never moving from the far wall, while he listened to the orders being given around him. Very occasionally he spoke out and gave a command of his own. Thankfully, the second the soldiers spotted a guard up ahead they stopped. A large group of experienced security members then closed in on them, ignoring the warning shots and yells they were given. All six soldiers moved to the best defensible position nearby, a civilian house. The guards rushed over as fast as they could but all six made it inside before they could be stopped. Again, the soldiers fired warning shots. “Move inside,” Sherdan said into the radio in his hand. It would not be good if the troops found the shelter for the house and the people hiding inside. Five men rushed around the back of the house as another seven went in the front door. Gunfire erupted. Nothing could be seen on the cameras, only the sounds could be heard over the radio of one of the guards. Almost ten minutes later the guards emerged, escorting the six officers; with their hands tied and weaponry confiscated. Sherdan was gaining a very large weapons cache at a very low cost. “The family weren’t even found. We’ve checked on them. They’re all just fine, alarmed by the gunshots but otherwise nothing wrong,” one of the guards informed Sherdan. “Well done. Keep up the good work, all of you.” Sherdan beamed. No one harmed and only eight soldiers left to detain. As this very thought ran though his head another soldier was surrounded by six of the security team and captured. Only seven of the initial sixty to go. The guards knew what they were doing and were well practised. Even when bullets came flying towards them they did not flinch. Sherdan had never seen a more decisive and bloodless battle between two armies. Despite all the weapon fire no one had been hurt. He continued to watch as the last soldiers were rounded up and put with the rest. The security team made it look effortless. As soon as they were done they waited for further instructions. Sherdan had them stay on duty until the rest of the soldiers outside gave up trying to get in. All they while the command room had been focusing on the air-dropped squads, there had been activity on the edges of the country. Several soldiers had decided to try driving in and had fired up the tanks. They drove forward to a certain point and the tanks slowed to a stop. They still revved but went no where. The soldiers couldn’t even get them to reverse out of whatever they were stuck in. Before long, all of them were abandoned and the soldiers went back to their waiting. Within a few minutes the whole area was back to the way it had been before. Except for the moved tanks, everything was just the way it had been before the attack. This was a really nice short read and great light entertainment. It followed on well from the previous book, continuing to build on the characters and bad guys. I didn’t see the plot twists coming which makes it a great book as I usually do when reading. I also felt the whole believability wasn’t as stretched as it had been before but that could be because I feel even more embedded in the characters world. There was quite a bit of backstory in this instalment which did slow the pace of the book a little but I actually think it was a good thing. The backstory was told well enough that it still felt very interesting and as I’ve already mentioned served to really flesh out some of the characters. I really hope there’s more backstories and info in the next installments. 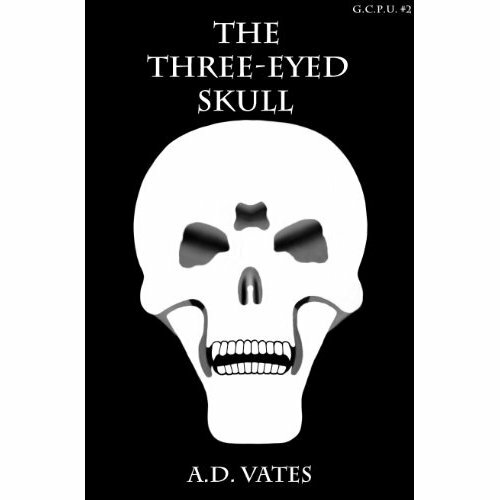 The third in the series is already out and I will be picking that up to also review shortly as I really do like these short, fun novellas. If the author keeps it up then these books are going to make a great series. With ebooks it’s harder to have a proper book launch. Amazon doesn’t let you put an ebook up for pre-orders unless you’re one of the big 6 publishers. The rest of us just have to pick a day and upload it and that becomes our published date. Then you have to wait for the Amazon bots to process the book and publish it, which can take anywhere between 6-24 hours. This makes it quite hard to build a hype towards the launch date to get the boost from initial sales to all the loyal fans waiting for the next book. There is, however, ways around this. So far I’ve had a fair amount of success in picking a day about 1-2 weeks after the ebook appears for sale on amazon and making a facebook event for this day. This becomes the books ‘official’ launch day. Having it so far after the upload day gives people time to get a few reviews, build hype and also make sure as many people as possible hear about it. (believe it or not, not everyone is on facebook) So here’s my step by step guide to a good book launch once the books published. Set up your facebook event. Use the front cover as your event picture and ‘the name of the book- book launch’ as the title. Location, the internet and fill in the details of the event with the date you want everyone to buy the book, why that day (it makes the amazon advertising robots go into overdrive if you have lots of sales in one day) the blurb of the book and the link to it on amazon. Also if you have any reviews already you can add choice comments from those, making sure to credit the reviewer. Once your review is set up, consider having a friend to help you on the day and invite them and make them a host too. This is optional but it can be tiring running the event by yourself the entire launch day. Tag teaming with someone can be a great way to keep the buzz without having to be glued to the computer for 15 hours of the day. Do make sure you trust them to be encouraging and not rude while also singing your praises too. Invite all your friends on facebook, and I really mean all. If they don’t like being invited by you beause you’re happy you’ve published a book and take offense at it they aren’t worth having as friends, in my personal opinion. Obviously use your discretion if you’ve got some friends on facebook that are actually only business contacts. I’ve assumed all your friends on facebook are all friends, family or non business acquaintances in some kind of way. Email anyone else who isn’t on facebook that’s a friend or family member and give them the details in your facebook event and the link to amazon. Let them know the date and thank them for their time. Also if there is anyone else you know who might be interested and you’ve not got them on facebook (or other social network) and email then send them a text with the details and the name of the book, again thank them. Ask 3-5 people right away to read and review the ebook, provide free copies if necessary. Make sure they’re not going to just be friends gushing about how long they’ve known you and that they always knew you’d be successful. You want honest reviews from people who know how to review well to get you started. This is easier when you’ve had a few books out because you an approach people who’ve reviewed earlier books but in the case of the first book, try any other authors/writers you know and make sure you point out you want an honest review. Getting loads of friends to give you 5 star reviews regardless won’t actually help at all. People see through it! Every day or two post something in the event on facebook. Ask friends who are coming to invite any of their other friends who might be interested. Post links and excerpts from the reviews as they come rolling in and chase any slow reviewers a couple of days before the event. The 3 days before do a count down on the event and I don’t mean hourly just the number of days to go. It’s also a good time to post a link to something like the list of kindle apps on amazon and remind people they are free and also work on computers. It’s surprising the number of people who don’t know this. I’ve been published over a year and posted the link to the apps a number of times but I still find at least one person every couple of weeks who doesn’t realise they can read my ebooks. On the day before the event check all your reviews are on amazon where people can see them and post on your blog about the launch event. Also text everybody who’s only reachable that way again and towards the end of the day send another gentle reminded email to your email invitees. Then get a good nights sleep and put the bottle of champagne in the fridge to chill. Include reviews if you’ve not done so already. If there are one or two friends you know really well who are going to buy the book really early, maybe even just after midnight, ask them if they’ll read the book quickly and post in the event when they’ve done with a small snippet of what they thought, even if that’s later evening on the actual day. Launch day. Get up reasonably early, depending on the day. You can get up later on the weekend but you want to be up before most of your attendants so you can post to the event page and tell people it’s time to start buying. You can also coordinate this with your helper if you have one. I’ve been a helper and got up first so posted that message for the author. It doesn’t matter as long as people know it’s time. So far I’ve always found there’s quite a spike in the mornings about the same time as the initial message. Then every couple of hours I post the amazon rankings (check them every hour and note them down somewhere, or take screenshots), especially if they shoot up quickly, making sure to thank people. Don’t start with the overall ranking unless that’s all you’ve got to go with. It sounds a lot better to say I’m 69th in the fantasy section of kindle. If your ranking gets above a few thousand then by all means include it, even point out the million or so books it’s out of. Also like and thank any time anyone puts that they’ve bought it on the launch page. It will encourage others to do and make the person who has realise how grateful you are. Finally if it gets to about 4-5pm in the afternoon and no ones posted to say they’ve finished reading, check on your few friends who you asked before to read quickly. Give them a very gentle nudge to post something, possibly even if they’ve not finished. This can often boost sales from the people still making their minds up. The ones who stilla ren’t quite sure that you’re the amazing author you say you are. When others start enthusing they will be more likely to buy it. I had a lot of success with this on the last book launch I did, about 3pm someone posted they had finished and that they loved the book. Less than two hours later another couple posted the same thing and there was another very large sales spike, almost as big as the starting spike which catapulted the book up the rankings a lot further. I’ve no doubt that it wouldn’t have happened without the recommendations coming in. At the very end of the day, just before the event is going to close, post the highest ranking you achieved that day, maybe a new reivew or two and a thank you message to everyone who helped. This bit’s all about good manners and that triumphant we did it feel. Make sure it’s toned to say ‘we did it’ rather than ‘I did it’. Then go crack open that bottle of champagne in the fridge and as a very awesome guy (Ben Cooley from Hope for Justice) I know said recently, celebrate what you want to replicate. Yup, you’re still not done. A few days later when some people have had time to read your new ebook (give different lengths of time depending on the length of the book, but no longer than a week) post a status asking thos readers who bought it and have read it to give some reviews. Stress being honest again and that you are very grateful. That’s the job done. With any luck it will get your book off to a good start though you probably can’t expect your book to stay that high unless you’ve had a few successful books already. All I’ll say is this has worked well for me. I hope it works for others too. Of course Print book launches done yourself are a whole other kettle of fish and not one I feel qualified to speak on yet. I recently burned my way through this series and film. We’ll start with what I thought of the series and then what I thought of the film. Normally the first episode of a series is the weakest and I struggle to feel like I want to watch the rest but that really wasn’t the case with this one. I loved it from about 5 minutes in and never stopped loving it. The characters were amazing and the idea of space cowboys was pure genius. I also really like the sense of humour everyone had and laughed out loud at a lot of points even though I occasionally watched episodes alone (for some reason it’s harder to laugh out loud alone). I think it helped that I recognised three of the actors from other sci-fi tv series and loved all the characters they had done before but I loved the characters in this even more. The bit where River goes cockney especially was a favourite. For a tv series I didn’t seem to notice the lower budget as I normally would so that was a definite plus, generally I really really don’t understand why they were only allowed to do one series. The film was not quite as good to start off with. They had deliberately tried to make it accessable without needing to watch the tv series and as such a few old issues between characters were rehashed for character development. I can see why they did it but I think I’d ave prefered they had assumed a little bit of knowledge, or set the characters up with new things rather than re doing an argument I felt had already been settled. The action was a lot better in the film, however and did make up for the downside a little. It also added a few new characters but that worked and added to the general fun of it and I love that they finally explained the reavers. I had been hoping they would. I actually though the series was better than the film though and I think I’d have prefered them to wrap up the whole thing with films that were just long episodes like Stargate sg-1 did when they were cut by their channel. The moment Sherdan had left her, Anya stepped to the other side of the bed and activated her power. Her clothes dropped to the floor out of view of the door so at a glance they wouldn’t be noticed. She contemplated going into the control room after him but she realised that now was also a good opportunity to check over her test results for herself. She walked through the door and went towards the lab. She only got lost a few times and had to backtrack twice before she found Hitchin’s lab. On the way, she moved out of the path of people whenever they came towards her. Not only did she not like the feeling of walking through something, but she wasn’t sure if other people would feel her moving through them as well. Annoyingly, Hitchin was in his lab when she got there. He had several machines going and Anya assumed that he was making more enzyme. She went over to his computer. The monitor faced away from the area Hitchin worked in and with all the noise from the machines any sound of the keystrokes would be covered. She nudged the mouse, getting rid of the automatic screen-saver. Hitchin’s login bar came up. His user name was saved and already there. She frowned. Passwords had never been her strong point. Her first try was ‘password’ but expectedly it told her she had only two tries left. Her second attempt was ‘Steven’. Sherdan had told her it was Hitchin’s middle name, although Hitchin often told people he didn’t have one because he thought it common and boring. Anya hesitated over her third try. It was her final attempt before the computer locked her out of the system for a while. Throwing caution to the wind she typed in ‘Sherdan’ and hit enter. ‘Access Denied’ flashed up on the screen for a third time. Rather than disappearing as it had both previous times it stayed with a five minute timer. It had already counted down a few seconds. Not wanting to sit and wait until it finished, she wandered around the room. It didn’t take long for her to be drawn to the whirring machines. There were hundreds of test tubes full of a pale pink liquid. On each one she saw a little label with ‘ENZ351’ on it. Suddenly the password clicked in Anya’s head and she rushed back to the computer. Hitchin still sat undisturbed at the other side of the room, absorbed in checking things with his microscope. The timer had over a minute left on it but watching it count down made it feel even longer. She tried really hard not to tap her fingers or breathe too loudly while she waited. The last thing she needed was for her impatience to disturb Hitchin or give away her presence. Eventually the computer allowed her back to the login screen. With her breath held she typed in the enzyme’s code. She smiled as the computer desktop appeared before her eyes. For a moment she stared at it. She had a Mac, like a lot of the creative people she knew, and hadn’t used a computer with Windows on it for many years. She pressed the start button and typed ‘results’ into the search bar. Lots of files came up so she tried ‘Anya’. Finally, only her folder came up. She opened it and looked at the contents. There was one document file, three scanned pages, and a picture. She started with the three scans. All of them were paper documents of medical reports. The first seemed to be the blood test she’d had. It listed what she’d had tested and the unexpected results. Most of it was codes and things she didn’t understand, but at the bottom was a few notes about the presence of a different enzyme. She raised her eyebrows when she read that it had faded out of her blood samples. She soon flicked to the next report. It was the same template and most of the numbers, codes and ticked boxes were the same. Her eyes scanned through the notes on the bottom. They were almost identical to the first, expressing surprise at the enzyme disappearing so quickly. The final scanned document was a request for more tests. There were several ticked to be done but none of them had ticks in the completed boxes. At the bottom were two words, ‘Patient refused’. She smiled. All the while she had flicked through the files she had forgotten about Hitchin. He coughed, making her jump. She knocked the mouse and it clunked against the keyboard. He turned towards her and for a brief second she panicked that she might be visible again. Thankfully he soon went back to his work. Being more careful, she closed the scanned reports and previewed the picture. It was an enlarged image of a sample of her blood. The enzyme had been circled but it wasn’t something that interested her. Neither was the final document; it reiterated what Hitchin had put in the notes of the blood test but no more. For a while Anya was angry at finding Sherdan had lied to her about the first blood test. Both of them had obviously worked. She really didn’t like how manipulative he could be when he wanted something. He really made it difficult to know what to think. The friendship between them, if it could be called that, was so volatile she felt confused most of the time. He evidently wanted to keep her safe but she suspected it was only because of his own plans for her. Plans she had no intention of honouring unless God approved them. She didn’t know what to do next. Anya had found what she’d come for but didn’t feel like leaving yet, so she moved the mouse back to the start button and clicked. She browsed what was there, including the recent documents. The five she’d just opened were in the list as well as some test results for other people. One entry just had Hitchin’s name as the title. She hesitated before clicking on it. The document popped up to reveal his diary. She had to put her hand over her mouth to stifle a gasp. Anya closed it again, her conscience wouldn’t allow her to read it. The temptation to see if she were mentioned was strong. She had wanted to know what the vision concerning her had been for ages. She jumped when Sherdan’s voice came through the intercom thanking everyone for their patience. It dawned on her that if they were all safe now Sherdan might be able to go back to the room she’d been left in. Anya sprinted back out of the lab through the closed door and towards the safe room. She needed to get back and put her clothes on before he walked into the room, or he’d know she had been sneaking about. There was no time to be careful about other people. She ran through them all without looking back. When she reached the room she realised she could have just run through walls in a straight line rather than along the intricate maze of hallways. She mentally slapped herself as she pulled her underwear on. Her jeans were awkward to get on when she couldn’t see her own hands and legs so she had to completely deactivate her power. She prayed no one would come in until she was decent again. She’d just yanked her top down over her stomach when she saw the door handle turn. She sat on the bed and looked towards the door as it was opened as if she’d been there for ages and the sound had disturbed her. Sherdan walked in and smiled at her. “For now we are safe. Are you tired?” He asked when he noticed she was sat on the bed. “A little. Is it all right to return to the house now?” He nodded. She got up and waited for him to open their secret exit. Before he could, they were disturbed by Hitchin. He seemed surprised to see Anya there and hesitated what what he’d been intending to say. Sherdan waited. “As you wish.” Hitchin’s eyes flicked to her before he left. Anya smiled when she realised he had been turned down in preference for her. By the look on his face it wasn’t normal for Sherdan to say no. When they were back at the house she suggested movies and hot chocolates. She didn’t really expect a yes. He’d been working a lot lately and would probably need to work some more. To her surprise, he not only said yes but let her choose the film. He really had turned Hitchin down just to be with her. She queried why he hadn’t done what Hitchin had wanted once their film was finished. For the first time ever he didn’t seem to want to answer. Anya didn’t know what to say. She didn’t approve of his plan at all, but she could understand why people did. For a long time many people had been fed up with the current choices politicians gave them. He had presented people with another, alternative, option. It was something different, even if no one knew exactly what yet. She only wished they’d see God could provide what they wanted. God was the ‘different’ they were searching for. The western church left a lot to be desired, however, when it came to God and their traditional and often boring way of making being a Christian appear. It made her feel equally as sad that churches in the west often attacked each other for their differences as well. She’d never understand why people couldn’t be nicer to each other. Sherdan was hope to people and, for the first time since she got there, she was seriously considering doing what she could to help him. She really didn’t like how he went about his goals, however. The blood tests were a perfect example. If she did decide to support him she knew not to admit it to him. He’d read too much into it and think they could get married or something similar. Thankfully, he’d not mentioned that lately. It worried her that he might do something drastic if she kept resisting him.